← Your geyser – does it help to turn it off and on? NUCLEAR: Is the battle lost? The owner and operator would be held financially responsible in the case of any accidents. A referendum was held in 1980 and the people of Sweden voted to decommission all nuclear power plants by 2010. However, only two nuclear blocks (Barsebaeck 1+2) were actually decommissioned. The decommissioning cost three times more than it did to build the reactors in the first place. That is why it is so important for the external costs of nuclear power to be included when doing a cost analysis. Nuclear power still provides about 40% of Sweden’s electricity supply. The plants are getting older and a conservative government is in power. However, elections are being held in September and there is a good chance that a leftwing/green coalition could come into power – they have promised to revoke the decision. Project 90×2030 considers nuclear to be an inherently inappropriate technology for South Africa. It is vital that its many external costs are included when calculating the true cost. These include the high costs of security, regulation, short and long-term waste storage as well as costly decommissioning. The long-term supply of high grade uranium ore is not guaranteed, lower ore grades entail significant higher costs for mining and enrichment. Further, any expansion for current nuclear capabilities would require an expansion of a specialised and expensive labour force, which would have to be trained and/or imported. More importantly, the risks of a nuclear accident need to be included in any cost analysis. If such a calamity would occur, the costs would be significant to say the least. When the long term damage to the environment from the nuclear fuel cycle, the heightened risk of nuclear proliferation in aggressive regimes, the issue of reactor accidents (which are unique in the energy system as they are low probability, but extremely catastrophic) and the simple fact that there is no safe way to store nuclear waste are taken into account, the short term benefits of a reliance on nuclear power are diminished by the even graver pollution and security concerns it produces. Nuclear power offers a feeble protection against climate change. There are numerous non-carbon producing energy sources currently available within industrial scale. Ramping up the world’s stagnant nuclear power plant production facilities to build enough nuclear power plants to really make a cut in the amount of greenhouse gasses would take much longer and would be more costly and risky. Nuclear energy is a deceptively inviting alternative – nuclear power plants are expensive to build, but cheap to run, where the opposite is true for traditional coal fired plants. Nuclear power plant builders in merchant states are either branches of the government, like Russia’s Atomstroiproekt or France’s Areva, or have close government ties. It is in the interest of corporate and governmental elites to promote nuclear power for a short-term financial bonanza in as many markets as possible, while ignoring the widely acknowledged problems of nuclear proliferation and the unresolved issue of storing waste, and which no country has effectively addressed. When all of these considerations are put together nuclear power makes a very costly and risky technology overall. 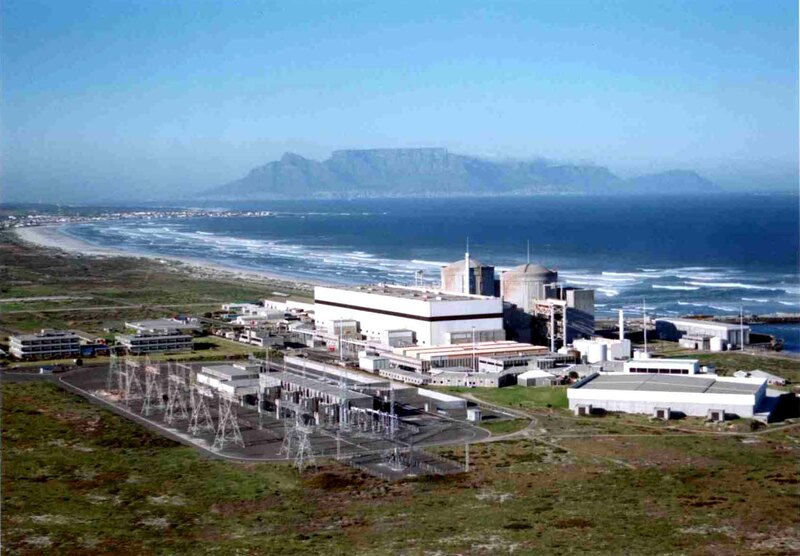 Project 90×2030 strongly urges the South African government to stop all nuclear developments with immediate effect. Picture courtesy of Vaandel.Photo of Koeberg from Eskom website. This entry was posted in climate change, Energy and tagged climate change, Energy, Global Warming, Sustainability. Bookmark the permalink.